In todays environment quality and safety in agribusiness requires real time monitoring services to control products from farm to fork. Until today monitoring meant very few sensors logging data at discrete intervals; this is not good enough anymore. To pro-actively prevent and manage logistics risks SYB provides real-time monitoring services delivered without the deployment of any infrastructure. Industrial Internet of Things (IIioT) technology can generate an added value to logistics, especially in agribusiness, where waste, cold chain interruption and food contamination represent everyday hazards for consumers' health and business continuity. See Your Box has developed an IIoT based technology able to fill the gap in the sector providing an innovative real-time logistics monitoring service. The customer is a global market leader in the sugar beet seeds industry. Each year it processes and sells one and a half million units each of them containing one hundred thousand seeds. These seeds are sold and sown in over fifty countries. The average R&D process lasts 7 years and will select a handful of new samples, if something goes wrong at year 2, a deadly failure might happen at year 4. Consequently real time monitoring represents a small price to pay to avoid such a huge financial distress. The customer needs to monitor all stages of seeds production. 24/7 Data collection from cold rooms, greenhouses and fields is critical to prevent that values such as temperature, humidity and light intensity exceed a precise range. SYB service allows the customer to have full vision and control of its production on all sites around the world. A cloud based standard service gives instantaneous access to several team members from different locations and sends SMS and email alerts regarding critical situations. 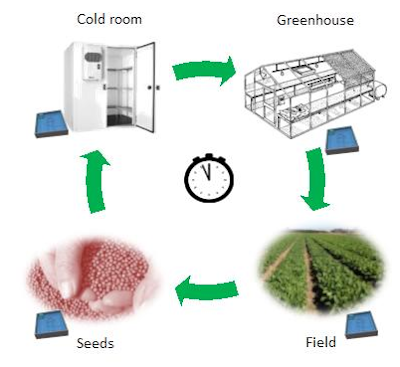 SYB system requires minutes to install and connect devices transmitting from cold rooms, greenhouses and fields. No money and time spent in expensive infrastructures. Everything is simple, even when devices are placed in the middle of nowhere for months without any external source of electricity or moved from location to location across states. SYB solution in a nutshell: several self powered small devices all built on the same hardware platform, connected to the network and capable to adapts their setting automatically according to place and situation. No human intervention needed. Simple, secure and super smart. More than 50,000 points collected over 3 months in 3 countries and 2 continents. 24/7 monitoring service of cold rooms, greenhouses and fields.